I sat on a snowmobile for the first time at age 62. I had become increasingly irritated by the noise coming from the recently upgraded snowmobile trail behind my vacation home, but when I looked closely at the riders, they seemed to be having fun. 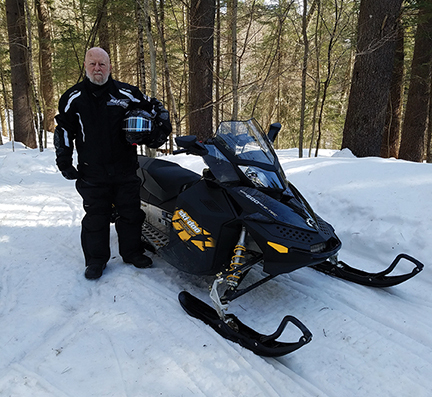 A local snowmobile dealer gladly sold me an “age appropriate” sled with all the bells and whistles and I set off, guided by the friend who had pushed for the trail upgrade, to view the world of snowmobiling. Besides learning that I too enjoyed the sport, I was amazed at the extent of the then existing trail system which was pretty primitive by today’s standards. I, of course joined the local club, the Deerfield Valley Stump Jumpers, and quickly learned what it took to construct and maintain the trails. That year, the club purchased their first Tucker SnoCat and began to extend and rebuild the trails and bridges to accommodate this new wonderful machine. From my first time in the woods with a group of guys, gals and kids, I was hooked and worked on trails whenever I could. What a great way to spend my retirement! This has led to 21 years of volunteering with the club. I served for a time as the trailmaster for a portion of the system, carried a chainsaw on my sled for years to clear trails and was a volunteer groomer with a snowmobile pulling a small drag, then with the Tucker and then with a PistenBully. As a board member for the past 20 years, I have done whatever I felt the club needed doing to enhance this sport of ours, including corresponding with the local town to get permission for members to ride local roads when necessary to access the trail system. I have been the club treasurer for the last 17 years. My wife continues to encourage me to keep active, but when I accidentally wear my FitBit on a ride, it tells me I’m an “overachiever” and should take time to celebrate. At 83, I’m no longer as active doing trail work but still try to contribute in “age appropriate” ways, including riding as many miles as my old body will tolerate.